Can it ever be truly Wordless Wednesday? 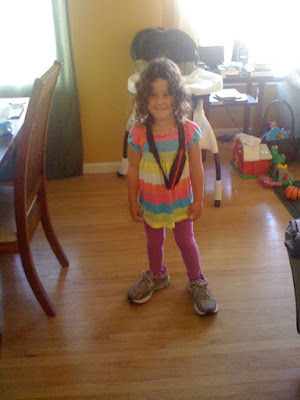 My middle girl loves wearing my shoes, runners included. And please note the SPI Belt around her neck! And also ignore the mess in the background. Although it's almost always there, so obviously I ignore it too. I can't wait to run with my kids. I love reading how Dorothy is a runner because of her mom, and they run together now. I hope that is me and my kids one day.